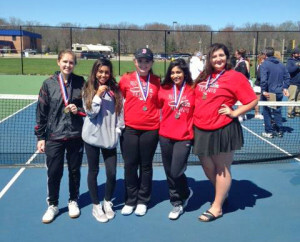 From left: Rilley Rivard and Leslie Rios #4 doubles champs; Anna Behrenwald and Mariah Rios runner up #1 doubles; and Jess Brunett, the #4 singles champ, at Fruitport. Number 1 singles Emilee Pastoor during her match with Ottawa Hills. Emily won 6-0 6-0. The Cedar Springs Red Hawks girls tennis team participated in the Fruitport Invitational on April 22. Jess Brunett was the #4 singles champ, and Rilley Rivard and Leslie Rios were #4 doubles champs. Anna Behrenwald and Mariah Rios were runner up in #1 doubles. Competing schools were Fruitport, Ludington, Cedar Springs, and Fremont 4. 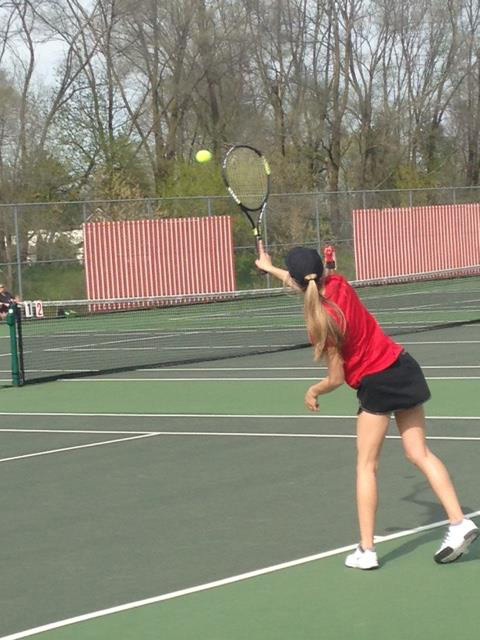 On April 24, Cedar Springs defeated Ottawa Hills 8 matches to 0 in a home match.